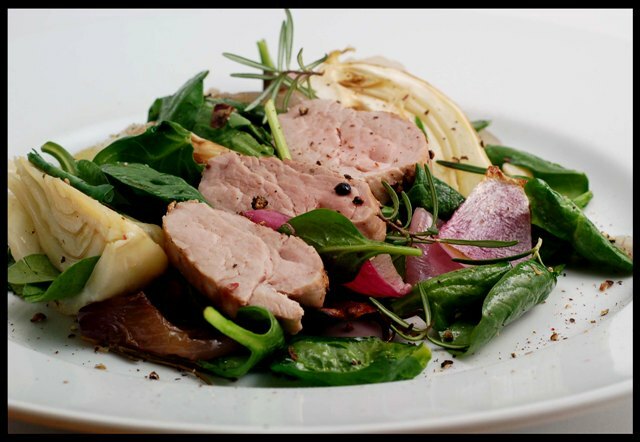 A delightful dish of roasted Pork Tenderloin with Fennel and scented with Rosemary before being served on a bed of baby Spinach. A wonderful Springtime dinner. The next couple of weeks our posts are going to be short and sweet as we have so much going on at work – it is actually very insane! We do still have to eat and have some very tasty and easy meals planned. Our first one includes “the other white meat”, Pork. Even though we love pork tenderloin, we never seem to make it that often. We really should as it is the leanest and healthiest of the pork cuts. As well it has less fat than chicken and twice the amount of iron. Not only is it good for us but you can do so many different things with it, from roasting or grilling or even stir frying. Tonight I made an easy dish of roasted fennel and pork tenderloin which was tossed with spinach. It was very light and very flavorful. If you love pork and fennel, this is a fantastic combination. Preheat oven to 400 (200 c). Place fennel, onion, garlic, rosemary and oil in a baking dish, toss to coat. Cook for 15 minutes. Brush the pork with oil and sprinkle with salt and pepper. Heat a medium frying pan over high heat, add the pork and cook for 2 minutes each side or until browned. Place the pork in the baking dish on top of the fennel mixture and roast for a further 15 minutes or until the fennel is tender and the pork is cooked through. Slice pork and toss with the vegetables and baby spinach leaves. 2 Responses to "Pork Tenderloin with Fennel"